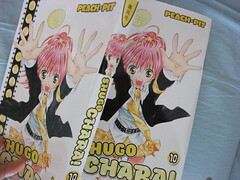 My samples for Shugo Chara #10 arrived. This is my first printed work for Company KC. I was curious what they were going to do with the design. The only thing they changed is the spine and the back. Sorry, I forgot to take a picture of the back. If you look carefully, the part that used to say "Del Rey" now says "Kodansha." Shugo Chara 10 is going to be released soon!